Home / Custom Domains / My domain is not active yet! It can take some hours for the DNS to fully propagate on the web. There’s nothing either us or you can do to accelerate the process, these things take time. 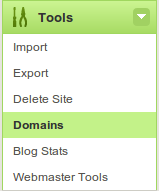 Head up to Tools → Domains in your blog’s dashboard. Submit a help request to our support team, filling the form below.